US President Barack Obama says he will turn to Congress in a bid to seek support – and legal domestic backing – to launch a “limited” military response against the government of Syrian President Bashar Al Assad who he blamed for an alleged chemical weapons attack that killed scores of civilians near the Syrian capital Damascus last week. Al Assad has denied any involvement in the attack. In an afternoon speech from the White House Rose Garden, Obama stressed that he had the authority to order such an attack but that securing support from Congress would be better for the country. “Our power is rooted not just in our military might, but in our example as a government of the people, by the people and for the people,” Obama went on to say. 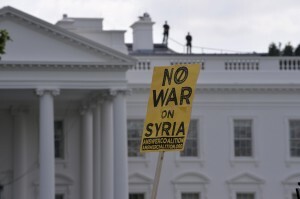 Although the US has beefed up its presence in the Mediterranean with two destroyers joining an earlier fleet of four naval vessels Friday, Obama’s speech softened the beating of war drums earlier in the week which appeared to signal a strike against Syria was imminent. Obama’s speech also comes two days after his UK ally British Prime Minister David Cameron failed to gain parliamentary backing for the military response. The UK government’s calling for “a strong humanitarian response from international society” including military action, was defeated by 272 votes to 285. On Thursday, South Africa joined a chorus of nations cautioning Washington against military action. “The outcome of such an action is unpredictable and will only worsen the conflict. It will ultimately be the people of Syria who pay the price, whilst those participating in the military intervention will return to safety far away from the crisis,” said a statement from the Foreign Ministry’s Department of International Relations and Cooperation. Obama may be setting the US navy for complete destruction, as floating targets. The banksters obviously love this, as they make money on all the unwarranted death and destruction of a soveregn nation Syria. We have a disgusting psychopathic government in the US. Of course the US & Saudis do not like the natural gasline going through Syria into western europe, the US seems to think they own everyone. They will kill anyone to keep their trash currency “dollar” the reserve currency of the world.